Soup in the summer? Yes, absolutely! Why not when the weather here by the ocean has been foggy and the mornings and nights are cold. This fall-like weather compelled me to make this flavorful soup. I was thinking of something easy and quick to serve on Sunday while watching Game of Thrones. This comforting soup is loaded with healthy vegetables like celery, corn, white beans, carrots, tomatoes and Napa cabbage. The smoky Kielbasa, fresh thyme and bay leaf just gives it a hearty flavor. It is even better when served with corn bread or any crusty bread. 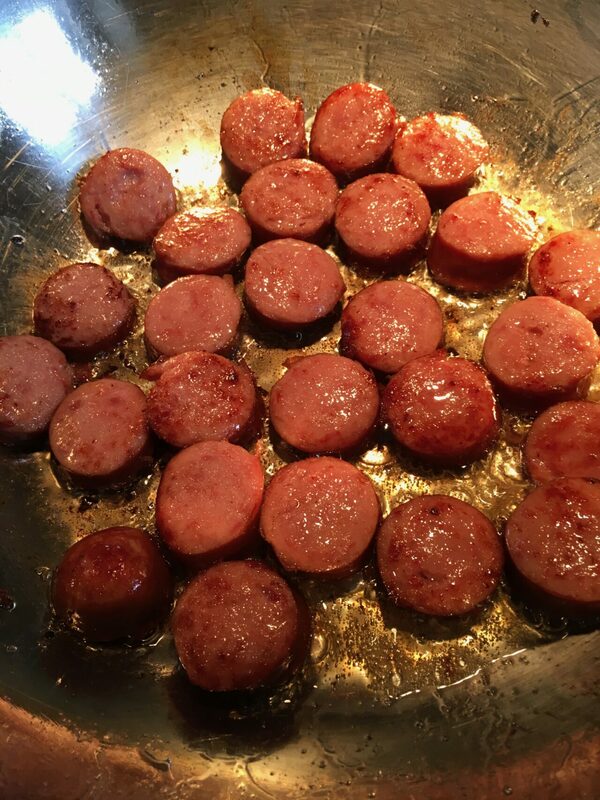 To prepare the soup, begin by browning the Kielbasa sausage in a bit of olive oil using a medium size soup pot. Once the sausage is slightly brown, take it out and set it aside on a paper towel to drain the fat. Next add the onions, carrots and celery into the pot. Give it 5 minutes to cook, mixing it once. Now it’s time to add the drained white beans, corn, thyme, bay leaf, chicken broth and the cooked sausage. For the canned tomatoes, pour the juice first. Squeeze the whole tomatoes with your hands to break it up while you add it into the pot. At this point you can start seasoning with kosher salt and freshly ground pepper to your taste. I start with only 1 teaspoon of salt because as the soup cooks, the sausage will add some salt. Adjust the seasoning later at the end when the cabbage is cooking. Cover the pot and bring to a boil on high heat. As soon as it starts boiling, lower the heat to simmer for 30 minutes. At the last 5 minutes of cooking, add the cabbage. Cover it and let it simmer again just until cabbage starts to soften. Adjust the seasoning with salt and pepper to your taste. That wasn’t hard right? 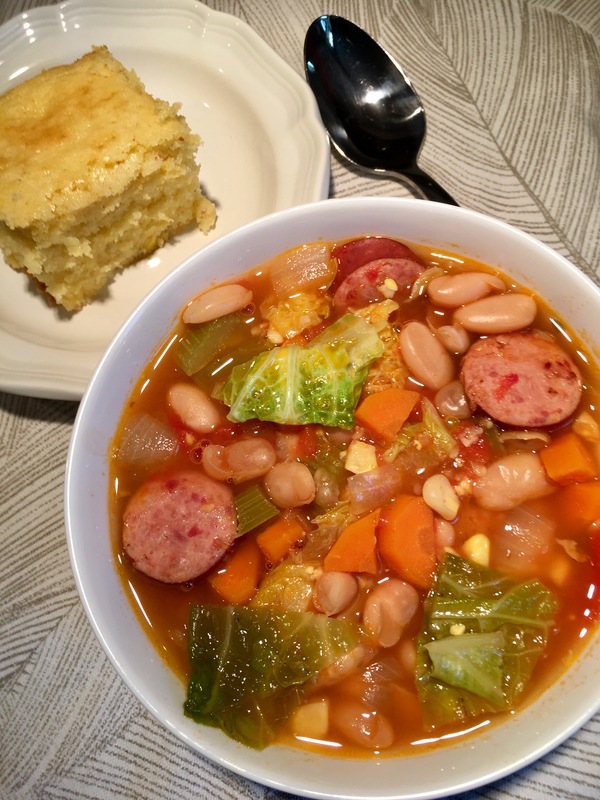 I’m sure you will like this warm soup with a side of cornbread or any crusty bread. Any leftovers (if there’s any) will be perfect for lunch the next day. 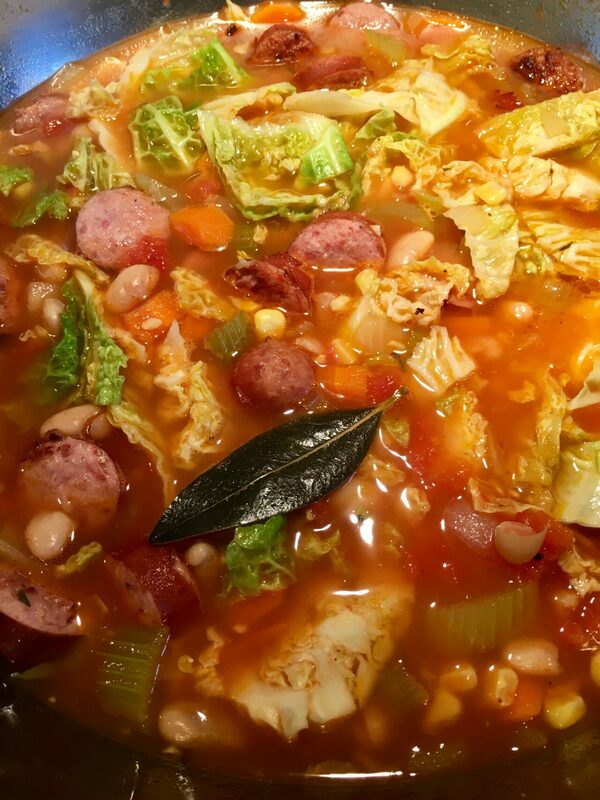 Comfort food in a bowl - This flavorful soup has white beans, corn, cabbage, and smoked kielbasa sausage. Place cannellini beans in a strainer and rinse it with water. Let it drain. Heat a soup pot on medium/high heat. Sprinkle 1/2 tablespoon of olive oil in the pot. Cook sausage in the oil for 3 minutes on each side until slightly brown. After it cooks, remove sausage from the pot and let drain in a paper towel. Lower heat to medium. Sprinkle the other 1/2 tablespoon olive oil in the pot. Add onion, carrots and celery. Mix it and let cook for 5 minutes. Add the beans, sausage, corn, chicken broth, thyme and bay leaf. Pour only the juice of tomatoes in the pot. Squeeze the whole tomatoes with your hands before dropping it in the pot. Begin seasoning with 1 teaspoon salt and a bit of freshly ground pepper. (The sausage will add more saltiness as it cooks). Cover the pot and bring to a boil on high heat. As soon as it starts boiling, change the heat to low and let simmer for 30 minutes. Add the chopped cabbage and let cook covered for 5 minutes on medium heat. Adjust seasoning with salt and pepper. Turn off heat. Serve soup warm with cornbread or any crusty bread.